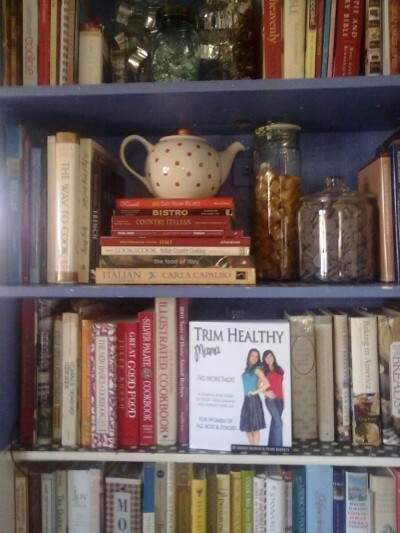 A little over three months ago, I ordered the Trim Healthy Mama book. I kept ‘stumbling’ into links and recipes during searches for health, no sugar and a few other search words I used each day googling for ‘healthy’ foods — or foods with no sugar. I would read recipes that women had adapted or linked from the THM book and I’d think: I could NEVER do this… well, at least not for long. And given the fact that I only know knew how to crash diet, I thought it would be pretty hard thing to justify spending $35. on a book. The only books I’ve bought in recent years that cost near that much were a couple of CAKE books! So, yeah, I have had my priorities. But a few days went by and I kept mulling over the thought that it just might be a good idea… I even thought that the price alone might force me to behave and follow the diet—even though I really didn’t have any idea what the plan really entailed. Then there was the thought that I surely wouldn’t do a vegan diet or an all raw diet… no, I had not been there done that… I just never wanted to be there doing that, that’s all. And then there was my beloved every morning cuppa tea with milk & honey. And then there was my every morning café mocha. Or two. And then there was my every single evening cuppa tea with milk & honey. And then, of course, there were all those other beloved carbie foods. The food of my people. But I wasn’t feeling well. Health problems were driving me to do something… anything… but something different than what I was doing. So I bought the book. I know… I know… I should have consulted my husband and should’ve talked it over. When the book arrived, I did talk it over with him. Now three months later, you know what I wish? I wish I’d explored it sooner—I wish I’d bought it sooner. But I didn’t. Looking back on that day — the day I was standing at my butcher block table next to the bookshelf in my kitchen — having just come in from the porch where my UPS man had brought me my package, I was excitedly opening up the cardboard packaging. I pulled out that enormous book—held it up—and at the time, I didn’t realize I was holding up the book against the backdrop of that bookshelf filled with every kind of not-so-trim-healthy-mama book there is!! I set the book down on the shelf and laughed… and wondered, where does this book fit in with my life? It didn’t fit in… and that’s why I was where I was that day. For some time, comments have been disabled… I will try out this method and see how it goes… I would love to have dialogue here—but occasionally, the comments were either spam or just vitriol and not helpful. May the Lord be honoured here.